Jon England's unique and flowing interpretation takes you right to the heart of the haunting story. Faithful to the spirit of the original Celine Dion mega-hit, the icicle-like piano notes float like the desperate souls upon the still night ocean awaiting rescue. The huge crashing conclusion draws you down into the icy depths of the sea of despair... and, eventually, peace. 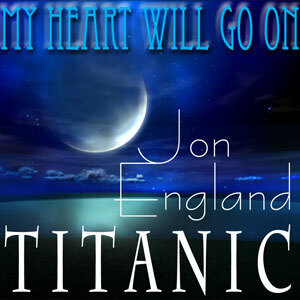 Known for his transcendently relaxed playing style, English pianotainer Jon England has created here a remarkably evocative recording of one of the worlds finest melodies. Always playing the tune as the original singer sang the song - Jon instantly connects with listeners who easily project their own emotional state onto his performance and immediately feel at one with the music. Download it now, and float away.